The 1910 E125 American Caramel Die Cuts Baseball Card Set contains approximately 41 cards measuring around 7" x 4". 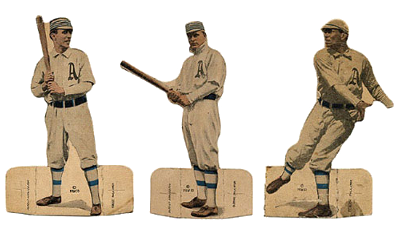 The fronts depicted player cut outs either fielding or batting. Skin tones on the player are colored in, as well as parts of the uniform. The backs contain a checklist of the team, and read "Action Picture Caramels." Some Hall-of-Famers known to be included are the E125 American Caramel Die Cut Honus Wagner, Tris Speaker, Eddie Plank, Frank Home Run Baker, Christy Mathewson and Chief Bender. CLICK HERE if you want to sell your 1910 E125 American Caramel Die Cuts Baseball Cards.